My son Coert was visiting these past days. He spent some time sorting out our VHS tapes and converting them to digital. Previewing most of the tapes Coert came across an interview I did for a (long lost) local television station. In this interview I explain the motivation behind my series of four WorcesterWare urns.... The phases in a woman's life. I have posted WorcesterWare before, but because of the many reactions I thought you might like to see this clip. Beware, the VHS was aged and damaged so the quality is poor. I, however, still look pretty good. Make sure to click on the lower (and smaller) "play" icon... otherwise you'll see all kinds of other stuff over at YouTube. As you all know I go to Princeton every Tuesday. 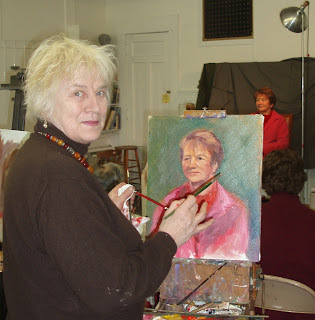 I go to Princeton to paint a portrait together with the Princeton Portrait group. One of us has to bring a model. That is not easy. Usually you have two or three turns a year. We paint from 9 to12, after twenty minutes we take a break and after some breaks we have coffee and cookies. The person who brought the model also has to provide for the coffee-break snacks. Sometimes they are very fancy home made pastries fruit, cheese, etc. and sometimes they are just doughnut holes. I have gained 10 pounds during my six year membership. Some weeks ago I took pictures of many of the portraits and the artist who painted it. Also of the model. As you can see, we all have a different view of the model.... The works are the view (eye) of the beholder. Next is Milton, scroll down for more. Here are Dave and Elly. 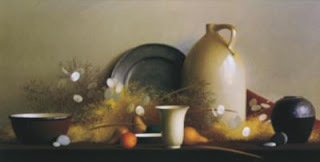 Sharon Bahosh and Merry's work... Sharon will be having an solo-exhibit at the Rockport Art Association this March. 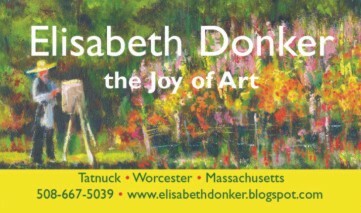 Be sure to have a look at her wonderful work! Last but not least the famous Sid Soloman. See the side-bar right for a link to his site. 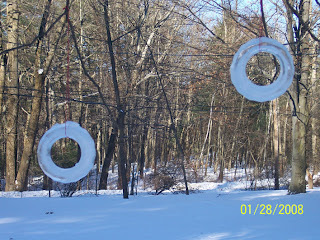 Here are some photos of my "ice rings". They decorate our yard during the winter frost. I had a late start this year because it was not cold enough but now I have about 100 rings hanging. If it stays cold enough I will make "ice hearts" for Valentine's day. I make the rings in coffee ring containers I buy at yardsales. They freeze overnight and then I hang them the next day. 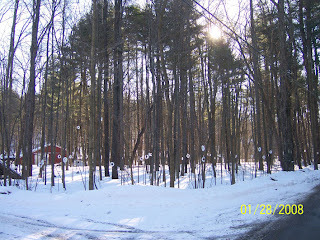 The ice rings brighten up the yard, especially when the sun hits them.